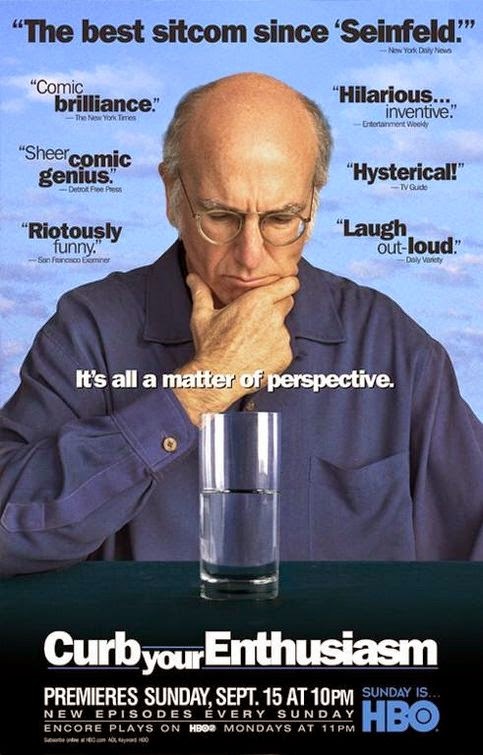 The main opening and closing theme song to Larry David’s Curb Your Enthusiasm is entitled “Frolic.” It was composed by Italian composer Luciano Michelini. It is said that David heard the song in a bank commercial years before and thought that the song had a joyful quality—a perfect match to the show’s otherwise gloomy feel. While IMDb lists some credits to this gentleman, there is no biography. It would seem that Mr. Michelini remains relatively unknown outside his native Italy. Curb Your Enthusiasm is an American comedy television series produced and broadcast by HBO, which premiered on October 15, 2000. As of 2011, it has completed 80 episodes over eight seasons. The series was created by Seinfeld co-creator Larry David, who stars as a fictionalized version of himself. The series follows David in his life as a semiretired television writer and producer in Los Angeles and later New York City. Also starring are Cheryl Hines as David's wife, Cheryl, Jeff Garlin as David's manager, Jeff, and Susie Essman as Jeff's wife, Susie. Curb Your Enthusiasm often features guest stars, and many of these appearances are by celebrities playing versions of themselves fictionalized to varying degrees. I don't know if this is a true story or an urban legend,but I heard that a woman watching the Woody Allen movie Manhattan saw her husband with another woman and used that scene as the basis for divorce.